Africa RISING recently held a series agriculture input fairs to boost uptake of improved crop varieties and technologies by Mali’s farmers. Inaugurated in June 2015 in Sikasso region, the events brought together input suppliers, distributors and farmers and provide a platform for strengthening agriculture sector partnerships. The fairs created awareness about new sorghum and millet varieties and hybrids, new technologies for enhancing and sustaining increased productivity and provided opportunities to farmers to make better choices on what to cultivate at the beginning of the cropping season in this region. 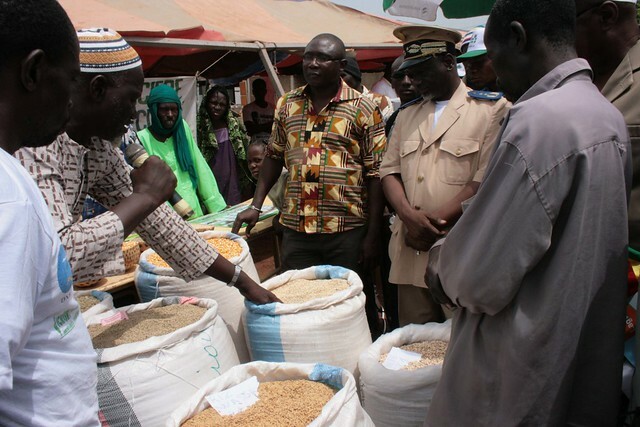 ‘We wanted to link input suppliers and distributors to farmers in time for the start of the next cropping season and to promote exchange and partnerships between producers, agro dealers and input suppliers,’ said Aminata Coulibaly Tangara, national director, Mali Agricultural Market Development Trust (MALIMARK) during the launch. Benefits of integrated cereal-legume cropping systems such as groundnut and cowpea with sorghum and pearl millet. 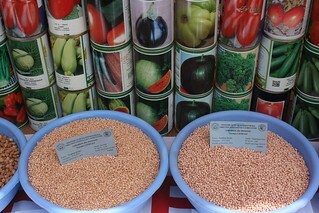 ‘We know that the quality and treatment of seeds alone can increase productivity by about 30%. Access to inputs also has a prominent role in determining the success of a cropping season and we want to give special attention to these in 2015-2016’ said Paul Dembélé, agricultural director of Sikasso region on the occasion of the launch in Bougouni District on 11 June. ‘For agriculture to be profitable farmers need opportunities to learn and master the use of appropriate technologies including access to and efficient use of fertilizer,’ said a representative of the mayor of Bougouni. After the launch in Bougouni, MALIMARK organized fairs in in five other locations, Koutiala, Kléla, Sikasso, Niéna and Zantiébougou. ‘The events are improving farmers awareness and access to new technologies of millet and sorghum and strengthening of agricultural inputs traders networks,’ said John Nzungize, technology uptake specialist at the International Crops Research Institute for the Semi-Arid-Tropics (ICRISAT) and coordinator of the ARDT_SMS project. ‘I am happy to be of help in providing quality inputs to producers, thus preventing the utilization of counterfeit products which affect the quality of farmers, production and their health,’ said Nonon Diarra, a representative of Crop Life in Mali. The ARDT_SMS project focuses on diffusion of proven technologies for raising the productivity and profitability of sorghum and pearl millet, the principal cereals of Mali, thereby raising incomes of farmers. The project is also supporting the government of Mali’s goal of ensuring adequate supply and use of quality seeds and good fertilizer supply to boost agricultural production. 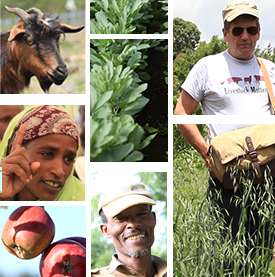 The project will build on existing institutional capacities, bringing together partners to pursue technology diffusion through multiple, contrasting approaches to meet the needs and opportunities of men and women farmers. Many dignitaries including the director of agriculture of Sikasso region, the prefect of the Circle of Bougouni, the mayor of the town of Bougouni, heads of technical services, village leaders of Bougouni circle, the private and public media attended the launch. Tags: africa rising, innovation platforms, participatory agricultural research. Bookmark the permalink.